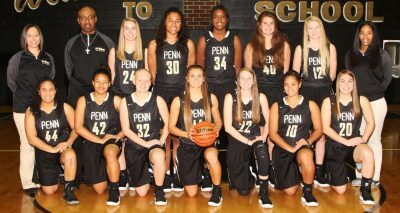 The Penn Kingsmen used a balanced attack to defeat the South Bend Washington Panthers, 62-37, in Northern Indiana Conference Girls Basketball action. Grace Adams led Penn with 11 points. Trinity Clinton scored 10 points, and Sara Doi and Jordyn Smith scored nine points each. Reganne Pate scored eight points, and Antreese Shelton scored six points. The Kingsmen improved to 13-1 by defeating the Panthers. ← Previous Story Girls Basketball: Head Coach Kristi Kaniewski Ulrich makes school and program history.